Flight A play has just concluded with 25:57 remaining of Level 18 (2,500/5,000 blinds and a 500 ante). After winning a monster pot at the very end of the night, Laurie Hilton is leading the pack of advancing players. The 19 players that bagged will return in the money on Day 2 (Tuesday Dec. 6th at 12:00 noon). A full list of all advancing players, along with respective chip counts will be posted in the next few hours. All of the players that bagged today's Flight A have the option to play again in any of the other three starting flights, as this is a best stack forward event. Any player that manages to bag multiple stacks will carry only their best stack forward, and will be paid $1,200 cash for each additional stack. After a preflop raising war, Laurie Hilton and a player to her right are all in. Hilton holds K♥K♠ in the big blind and her opponent in the small blind holds A♥A♣. Hilton is at risk until the flop comes K♦Q♥5♦, giving her a set of kings. A very excited Hilton leaps out of her chair in excitement. The J♣ turn and 2♣ river are safe for Hilton, and she will double up. Hilton has a total of 240,000, and after a very close count of her opponent's similar stack, it's determined that the player in the small blind is eliminated from play as Hilton's chiplead is increased even further. *As a reminder, they will play down to the 12% of the field tonight, which is 19 players. When they reach the final 19 players, they will bag and tag for the night, and return to play Day 2 in the money on Tuesday at noon. The remaining 34 players are now on a 60 minute dinner break. They will return to play Level 13 with 1,000/2,000 blinds and a 300 ante. They will play down to the final 19 players tonight, leaving all of those players in the money on Day 2. There were a total of 151 entries in today's first flight of the $600 No-Limit Hold'em Re-Entry Event #1. They will play down to the final 19 players before bagging and tagging later tonight. Those 19 players will join the advancing players from Flights B, C, and D to play Day 2 on Tuesday at 12:00pm. All players that make Day 2 will return in the money, and any players that bag in multiple flights will take home $1,200 for each additional stack they bag, with only their largest stack advancing to Day 2. According to Laurie Hilton, she doubled up through Anthony Mascia, known in the poker world as 'The Doc,' right before the last break. Hilton explained that Mascia opened to 2,200 from under the gun, and she had called in the small blind. The flop came 9-4-2 rainbow. Hilton checked, Mascia bet 4,000, and Hilton raised to 9,000. Mascia called the raise. Hilton then announced that she was all in right before the Q♠ was dealt. Mascia called and the players tabled their hands. Hilton had flopped a set of fours, and Mascia had turned two pair holding Q♣4♣. The six on the river was safe for Hilton awarding her the double up. Hilton is now the chip leader in the field. 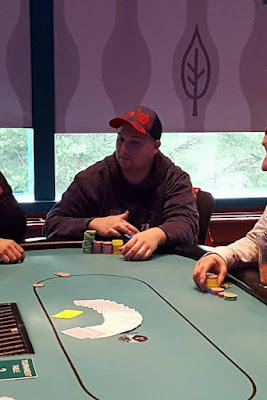 *Jonathan Berger won the $300 Omaha Hi-Lo 8+ event back in October in the World Poker Finals here at Foxwoods, taking home $4,767 and the coveted globe trophy. He then went on just nine days later to win the $300 HOSE event as well, taking home a second globe and $3,780. Prizepool Information for this event can be found by clicking this link. 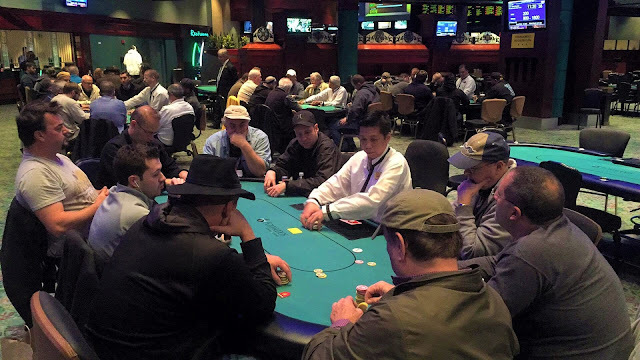 There were a total of 51 entries in today's $300 Omaha Hi-Lo 8+ Event, generating a prizepool of $12,862. The top 7 places will be paid, with first place taking home $4,181. 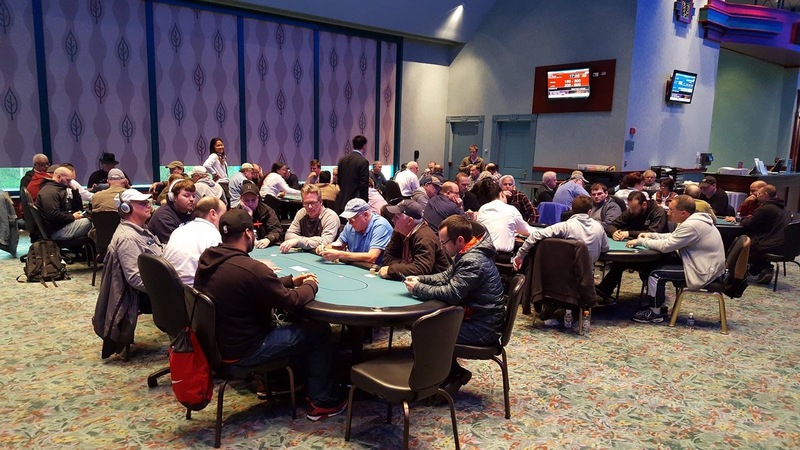 At this time, they players are in the midst of Level 5 (100/200 blinds and 200/400 limit), and they have not lost a player in the field yet, as 51 players remain. Paul Nardozza raises to 800 in middle position. Laurie Hilton calls on the button, as does Angel Pantoja in the small blind and Daniel Marrs in the big blind. The flop comes K♥10♦8♥. The blinds both check, and Nardozza bets 1,400. Only Hilton calls. The turn is the 7♦. Nardozza bets 2,400, and Hilton quickly calls. The river is the A♠. This time Nardozza opts to check, and Hilton bets 10,000. Nardozza very quickly calls, and Hilton tosses her cards into the muck. Nardozza moves his cards forward and a player at the table tells him that he needs to show in order to be awarded the pot. Nardozza says that he does not have to show and asks the dealer to call the floor. "It doesn't matter," Hilton says, "He doesn't have to show." The floor comes over and confirms that Nardozza does not in fact have to show his cards, and the pot is pushed to Nardozza as his cards are moved into the muck. Event #2 is now underway. At the present moment there are 45 entrants at the very start of Level 4. Players wishing to enter have until the the start of level 5 to do so, but there are no re-entries allowed in this event so once a player is a eliminated they do not have the option to re-enter. For full details of this event, including structure information, please see below. Players are just returning from their first 15 minute break of the day. Michael Guzzardi is off to a great start, and seemingly holds the chip lead in the room at the moment, with 55,000. Foxwoods regular Laurie Hilton is not far behind Guzzardi, holding 45,000 of her own. After a preflop raising war, three players are all in. Jonathan Sorscher holds A♣J♦ against Frank Passantino's A♠9♦ and another players' K♥Q♠. The flop comes A♦Q♣3♦ giving Sorscher the lead with his pair of aces, jack kicker. The J♥ turn increases that lead, giving Sorscher two pair. The 5♥ river is safe for Sorscher, and his two opponents are sent to the rail with the option to re-enter. The blog staff recently saw James Magner walking away from the table, and heading to the cage. "Headed to re-buy," Magner said as he slightly shrugged his shoulders. Billy Pappas filled us in and said, "I got lucky. Straight over straight, I had the higher straight," as he stacked his chips. Flight A of Event #1 is now underway. At the present moment, the clock shows 99 entrants. Anyone wishing to enter/re-enter has until the start of Level 9 to do so. This tournament hosts a huge $500,000 guarantee, and features four starting flights, as well as stack buy-backs. Full information about this event, including structure sheet can be found below. All Day 1s will play down to approximately 12% of the field. All players who make it to Day 2 will return in the money on Tuesday Dec. 6th at noon.